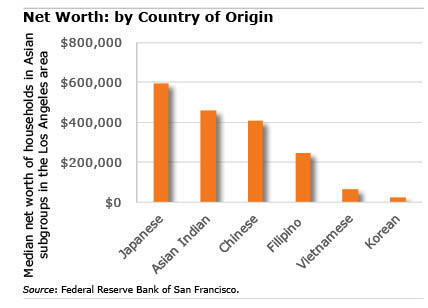 Inequality also emerges between generations in upwardly mobile Asian-American families. “Nothing is universal, but education as a path toward greater prosperity and social prestige is pretty pervasive among Asian parents,” said Alex Pham, a Californian who emigrated with her parents from Vietnam as a child after the war, later earned two college degrees, and is now is now a content strategist for technology companies. It is important not to always lump Americans into one big group when assessing their financial and retirement prospects. But even within the Asian-American community, this population’s diversity reveals more about the imbalance between its haves and have-nots. In other recent blogs, Squared Away focused on the unique financial challenges facing the nation’s African-American and Hispanic communities. Putting Asian Americans in a single bucket, or even by country of origin fails to capture important sources of inequality. Chinese immigrants may be undocumented, may be highly educated STEM workers, or wealthy entrepreneurs. The latter groups may be yearning to be free, but are not the huddled masses of folklore. One suspects that economic status in country or origin is strongly predictive of economic status here. Very true and valid points. Much harder to measure than simply grabbing available statistics. I think there’s a risk whenever you view a metric (net worth) through the lens of a single factor. If you did a regression analysis, you’d probably see this factor as less significant than some others (and as is the case with this one, a proxy for how long someone has been in the country). I was shocked by the statistics. In fact, although most of the Chinese recent years came here illegally and ended up undocumented or is working on the asylum, most of them who got green cards/ citizenship, they either do not earn much, or they do not file taxes up to the middle class level. So the data shown here looks biased towards those rich Chinese people.